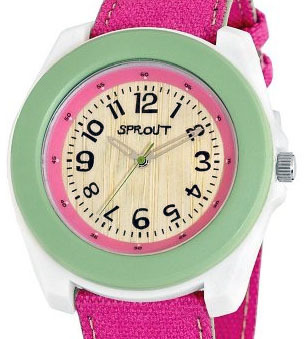 Keep time while being green with Sprout watches! Do you want to be on time and care for the environment simultaneously? You can do exactly that with these Earth friendly watches from Sprout. 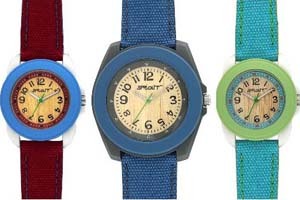 Sprout has developed an eco-friendly watch, perfect for those who want to be more environmentally aware. The materials used for each time piece are quite amazing – bamboo, corn resin, mineral crystal glass and organic cotton. The clever folk over at Sprout have even fitted the watches with a mercury-free battery. I love that the Sprout is simplicity at its best. The all natural bamboo face is refreshing to look at, the quirky numbers are cute without being gaudy and knowing that it’s better for than the environment than others on the market has won me over. Watches come in two sizes and eight colour combinations, perfect for the young and (not so) old! The cleverly designed eco-friendly watch is available from Sprout for US$30, with international delivery available.